We can say after several summertime visits, and one very recent one, that Sardine is one of the Madison brunch and breakfast restaurants that seldom disappoints. The unusually eclectic, big city menu offers great variety for brunch, ranging from a burger to, duck confit salad, to omelets, to oysters on the half shell. And as a plus, Sardine is one of the few local establishments that understands that a reasonable portion of good food trumps mass quantities of mediocre fare. To clarify the pronunciation, we have heard it called Sardine, as in the little wiggly fish, and Sardine, with the second syllable pronounced like fine dining. A phone call confirmed that the former is correct. It is pronounced like an oily, but tasty diminutive silvery fish. Joe – Sardine is located at the head of Williamson Street and occupies a section of a revamped structure dating from the earlier part of the 19th century, called Machinery Row. While it does overlook Lake Monona, there is an unsightly parking lot between the somewhat limited outdoor seating and the lake. However, this is a terrific bit of revitalized architecture that is so horribly lacking in Madison. (no further comments on this subject). The interior flooring ranges from well worn wide-boards to those itsy bitsy period tiles. Walls seem to be original stone either left natural or painted. All in all, a warm and attractive space that could be called cozy despite its commercial heritage. Although I prefer to alleviate my germophobic fears by being able to peer into the kitchen, the restaurant seems to be well organized, neat, and tidy and gave no cause for concern. 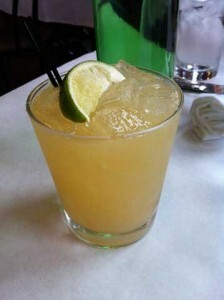 Marie – I ordered a Margarita that indicated it was made with fresh orange and grapefruit. I like them on the rocks, no salt. It was perfectly fresh and refreshing! 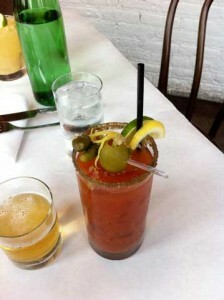 Joe – I started with a bloody mary which is a drink that is difficult to comment on because there is no specific formula, and therefore no firm expectation. Despite that statement, mine was quite fine except for the overuse of celery salt which was both in the drink and on the rim, making straw use a requirement to avoid being overwhelmed. It was nicely garnished with an olive, gherkins and lemon rind. For about the third time, I ordered the baked creamed eggs which seemed like an especially wise choice on a cold and blustery November day. Each time I have seen or ordered this dish, there was a desire to have it baked a little longer until the whites are fully set to avoid the unpleasant snotty texture associated with undercooked egg whites, not to mention salmonella. Getting past that, this is a dish that seems a bit extravagant with rich creamy sauce and a bit of prosciutto in every bite . Sardine seems to use very fresh ingredients without the fanfare of some other well-known eateries. My creamed eggs had fresh, full leaf, ultra green, spinach when they could have passed off on chopped or frozen. This dish is accompanied by three diagonal cuts of crusty baguette and a petite salad. Near perfection. 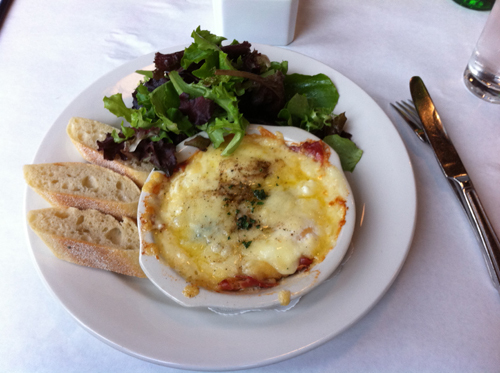 Marie – Having had the baked creamed eggs before and not wanting a repeat. 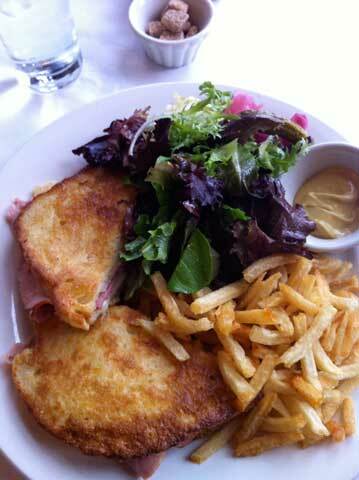 I chose the croque monsieur from the sandwich menu. Why? because it reminds me of Paris and sampling the wide variety of croque presentations is a fun experience. The bread was drenched in butter and beautifully grilled, meaning that it is a crunchy tasty winner. More butter equals better flavor (who cares about fat, it is a Sunday). Keeping with the better, rather than more food concept, serving this open-faced would both cut down on the bulk and show off the grilled gruyere cheese. When I vision this sandwich, I see it made with a significant hunk of country cured ham rather than deli-sliced honey cured city ham. A bit of a disappointment as the ham seemed like it could have come from any Piggly Wiggly market, but that is me being really picky and wanting to see this more special and worthy of Sardine. The ham’s sweetness did not meld well with the richness of the cheese, and needed to be cut with a bit of mustard (supplied without asking) on the side to make it fit the savory concept of the sandwich. The petite side salad served with many of the brunch dishes is absolutely outstanding. Very fresh spring greens are perfectly dressed. Meaning that each leaf is coated and there is no puddle on the plate. This small detail is one of Sardine’s real pluses. On the minus side however, are the accompanying pomme frites (french fries). Although the flavor is very nice, the pieces are so small that they must be eaten with a fork. I can only think that McDonalds got all the long ones. While I probably won’t order the croque monsieur again (much preferring it as served at Milwaukee’s Coquette Café), I will not hesitate to return to Sardine, and give it my highest recommendations. Check for two $35.00 (not including tip) included one drink each. A modest amount that is actually a great value for an overall fine experience. We would love to hear about your thoughts and feelings about this post. Just send us an email and we will review with the intent of publishing if we feel it is appropriate. We are not adverse to disagreement, and contrasting opinions will not disqualify your comments. We don’t publish links, shouting, vulgar language, or insults, but honor spirited discourse. This entry was posted in Food for THOUGHT on November 16, 2010 by AtlasSigns.